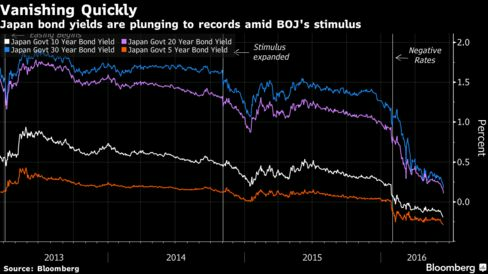 Japan’s government bonds surged, driving down yields from five to 40 years to record lows as the yen surged after the central bank kept policy unchanged, while the Federal Reserve cited Brexit risk as a reason for standing pat. Government debt worldwide has rallied to its best start to any year in two decades as Brexit concerns intensify pessimism that the global economy will struggle to regain momentum. Germany’s 10-year sovereign yield fell below zero this week for the first time. The U.K.’s June 23 referendum on whether to leave the European Union was factored into the Fed’s decision to leave rates steady, Chair Janet Yellen said on Wednesday in Washington. The Fed also eased back on interest-rate increase expectations. Yields on all benchmark sovereign securities in the world’s second-largest bond market fell to records Wednesday, extending a rally fueled by global haven flows and the Bank of Japan’s January decision to introduce negative interest rates on top of purchases of about 80 trillion yen ($771 billion) a year of government debt. The BOJ left policy unchanged at the end of a two-day meeting Thursday as most economists had predicted. Japan’s 10-year yield fell to a record minus 0.21 percent, while the 20-year bond yield dropped to an all-time low of 0.095 percent. Yields on 30-year bonds declined to a record 0.15 percent and five-year yield declined to a record minus 0.305 percent. The 40-year yield hit an unprecedented 0.2 percent Thursday. Global government debt had gained 5.5 percent this year as of Wednesday, the most for any comparable period since 1995, according to Bank of America Corp. indexes. Japan’s sovereign bonds generated returns of 6.6 percent, the data show. The yen rose to 103.61 per dollar, the strongest since August 2014. “JGB yields are at levels where they should be peaking out, but given that the U.K. is the underlying driver, Japanese yields are unlikely to reverse course and rise just yet,” said Katsutoshi Inadome, senior bond strategist at Mitsubishi UFJ Morgan Stanley Securities Co. in Tokyo.